Keynes and Kalecki both assume that private investment determines (but is not determined by) private savings. For Keynes, the desired level of saving is an increasing function of GDP, somehow related to the psychology of the society; ‘autonomous’ shifts of investment are determined by the state of long-term expectations. For Kalecki, the saving propensity depends on the income distribution in a capitalist society, while investment expenditures are determined by past investment decisions. The causality link between investment and saving runs through profits. 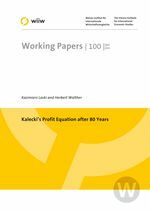 We take a look at short-run and long-run aspects of Kalecki’s fundamental profit equation: (1) We argue that the short lag between investment decisions and expenditures is an essential element of any meaningful interpretation of Kalecki’s profit equation. This lag has critical implications for the interpretation of the multiplier, for the story of ‘wage-led versus profit-led growth’ and for the various tax paradoxes related to the Kaleckian profit equation. (2) We argue that an excess of desired long-term saving over investment, which might be caused by demographic ageing in Western economies, can only be eliminated by accepting the necessity of a permanent primary public deficit and/or active redistributive policies.